The list of 50-50 colleges and universities is designed to provide students and their families with options for good schools where students are likely to be admitted. What makes a 50-50 school even better is when it provides generous financial aid. This can come in the form of scholarships and need-based grants. And quite a few 50-50 colleges do and are worth looking into. The Integrated Post-secondary Education Data System (IPEDS) includes information on the percentage of freshman receiving institutional grants and the average amount of the grants. These consist of all of the non-athletic grants and scholarships awarded by the university or college. There are 116 private 50-50 schools where at least 90% of freshman receive institutional scholarships and grants with an average award that is 40% or more the total cost of attendance. The average awards ranged from $15,254 to $34,679. A total of 81 schools had 99% or more of freshman receiving institutional aid. Since public colleges cost less, I used a different set of requirements to identify those with generous financial aid. Schools had to have 80% or more of freshman receiving institutional aid and it had to represent at least 20% of the total cost of attendance for in-state students. A total of 28 public universities met these requirements. The average awards from these scholarships and grants ranged from $4,892 to $15,212. Unfortunately, IPEDS doesn’t distinguish between grants based on financial need and merit scholarships. However, when virtually every freshman at private colleges receives some form of an institutional grant, you can assume that a portion of that has to be for merit scholarships. According to Common Data Set posted by institutions, at least 61 of the colleges awarded merit aid to 20% or more of freshman without need. This included 16 public institutions. When 90% or more of freshman are receiving institutional aid, chances are these schools are probably not meeting 100% of financial need. Generally, when colleges meet full-need, the average institutional award will be above $35,000 but the percentage of students receiving awards will generally fall to below 60%. That’s because the vast majority of schools that meet 100% of need do not offer any merit based aid. Of the schools with available Common Data Set data, only 15 report meeting on average 90% or more of freshman need. You’ll notice that the private colleges on the list are small. Only eight colleges had more than 3,000 undergraduates. This simply reflects the reality that there are more small schools than larger schools among private schools. Furthermore, since students tend to prefer larger schools, smaller schools are more likely to offer aid to entice students to attend which larger schools don’t need to. 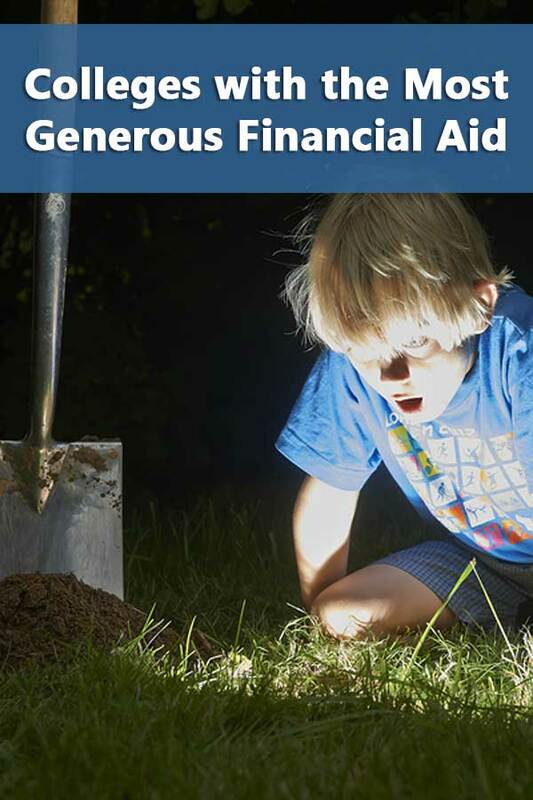 The following table lists the 50-50 schools with the most generous financial aid. Pennsylvania has the most with 16 on the list, 15 private and one public. New York is second with 11 and Illinois, Indiana, and Minnesota tied for third with 8 each. Thirty-eight states have colleges on the list. You can find all 50-50 colleges and more on the DIY College Rankings Spreadsheet.